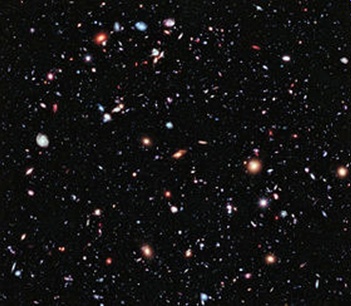 Picture taken by Hubble telescope shows the furthest galaxies ever photographed. Every speck is a galaxy and some of them billions of years old. Stephen Hawking the most respected British scientist of modern times died on the 15th of March 2018 at the age of 76. He was confined to a wheel chair for most of his adult life. He spoke through a computerised voice system in an American accent. His name that has been heard in relation to cosmology and Theoretical Physics.He was the Director of Research at the Centre for Theoretical Cosmology at the University of Cambridge. Both his parents were graduates from Oxford even though they did not come from ‘elite’ families. Their son Stephen was born 300 years to the day Galileo was born. They obviously believed in good education and their son Stephen was a graduate of the University College, Oxford. He was not a highly keen student and spent a lot of time in the College boat club. But he got a first class there and went to Cambridge. But even there he did not find enough to satisfy his interest in Cosmology and fell into a depression. he obtained his PHD degree in applied mathematics and theoretical physics, specialising in general relativity and cosmology, in March 1966. He met Jane Wilde during his time at Cambridge and a few months later he was diagnosed as suffering from Motor Neurone Disease (MND) and given 2 years before he would become completely disabled. He refused to be discouraged. At this stage Jane’s presence was crucial to his determination to overcome all obstacles and he obtained his PhD in Applied Maths and Theoretical Physics. He was inspired by Roger Penrose’s theories of singularity and black holes. Simply stated, a black hole is the ‘empty space’ (to us!) left after the death of a star. But Penrose and Hawkins believed otherwise. Hawkins in fact postulated a radiation from the centre of a black hole and it is called Hawking’s radiation. During his undergraduate years in the early ‘60s and later his graduate years he cooperated with fellow scientists in the description of many cosmic phenomena. He received many prizes and awards. His first book was The Large Scale Structure of Space-Time, written in collaboration with fellow scientist George Ellis in 1971. Jane Wild was his first girlfriend while at college. As his condition deteriorated he was helped by the support of Jane who he married later. they travelled to the United States several times for conferences and physics-related visits. They had three children, a daughter and two sons, born between 1967 and 1979. The challenges to Jane who had her own career, were tremendous and the relationship between her and Stephen broke down. During his troubled period Stephen had grown close to one of his nurses Elaine Masan and after his divorce in 1995 he married Elaine. But there were many strains on this relationship and it came to an end in 2006. Thereafter Stephen resumed a closer relationship with his first wife Jane and his three children. He wrote the book ‘A brief History of Time’ in 1988. It was a science-based book bought by more people in history than any other publication known. But many say that they did not read the book to completion. His first wife Jane and daughter Lucy are writers too. Jane’s book ‘Travelling to Infinity- my life with Stephen’ appeared in 2007 and was made into the film ‘The theory of Everything’ in 2012. It was a slow progressing form of motor neurone disease called Amyotrophic lateral sclerosis (ALS). It gradually paralysed him over his life time. The diagnosis was given in 1961 with a life expectancy of two years but Stephen defied all medical opinions and lived with his disability in a motorised wheel chair with a speaking device and motor control finally carried out by batting of his eye lids which were the only movable parts in his body in the end. But he conducted his scientific life of discovery of the cosmos and unique original phenomena which a man or woman with all motor and sensory faculties would have found impossible. He nearly died a few times. In 1985 after a visit to CERN, at the edge of France and Switzerland, Stephen contracted pneumonia and was on life support. Wife Jane demanded the support to be continued even when she was advised that it is better to withdraw support. in 1986 he received a computer program called the "Equalizer" from the organisation called Words Plus. 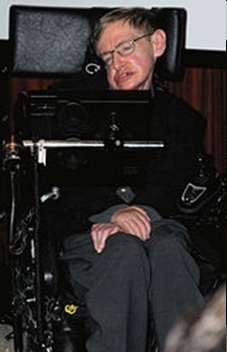 Stephen claimed that with the use of a computer now he had more words at access than before he lost his voice. Gradually the motorisation was fine tuned to let him use his eye lids and chin movements. Towards the end of his life he had increased difficulty in breathing and succumbed to pneumonia often. On 26 April 2007, Hawking flew aboard a specially-modified Boeing 727 jet operated by a zero gravity company off the coast of Florida to experience weightlessness. Hawking died at his home in Cambridge, England, early in the morning of 14 March 2018, at the age of 76. His family stated that he died peacefully. In 2006 Hawking posed an open question on the Internet: "In a world that is in chaos politically, socially and environmentally, how can the human race sustain another 100 years? ", later clarifying: "I don't know the answer. That is why I asked the question, to get people to think about it, and to be aware of the dangers we now face." Hawking expressed concern that life on Earth is at risk from a sudden nuclear war, a genetically engineered virus, global warming, or other dangers humans have not yet thought of. Such a planet-wide disaster need not result in human extinction if the human race were to be able to colonise additional planets before the disaster, thought Hawking. Thanks Zita for reminding us about the massive contribution this undoubted genius made to our knowledge of the Universe. He also stands out for his exceptional courage and determination to achieve what he did while fighting his own battle with ALS. This is really the stuff of Science Fiction but in the Real World. As doctors, it must make us thunk of deeper issues such as extreme physical disability and how mental functions can persist and function in the face of such disability. A Great Man if ever there was one. I salute him. Thanks Zita for that great piece on the great man. His scientific achievements apart the life he lead despite his disability is a lesson for all humanity. May his Soul Rest in Peace. I have always been fascinated by exploring deep Philosophy and Science. For like minded amongst us, I would recommend viewing this YouTube clip featuring Stephen Hawking, Arthur C Clarke and Carl Sagan. Called "God, The Universe and Everything else" it was hosted by the late Magnus Magnusson on BBC TV. This program brings the three together to discuss "the Big Bang theory, God, our existence as well as the possibility of extraterrestrial life." Hawking, of course, talks through his signature speech synthesizer, and Sagan joins up through a satellite link — beamed through, yes, the very sort of floating miracles of engineering that Clarke wrote about in his novels. With minds like these, you can rest assured that the conversation won't stray far from what Sagan calls "the fundamental questions," nor will it come untethered from established human knowledge and float into the realms of wild speculation and wishful thinking. And of course, in such conversations, a sense of humor like Hawking's — a man who, not expected to reach age thirty, would nevertheless live to see more advancement in human knowledge than anyone else on the broadcast — never goes amiss. It was great hearing these three great minds in discussion together. Zita, Thank you for ‘A Brief History’ of this amazing individual who did not let his mind be stunted in spite of major physical disabilities. He in fact, had said at some point, that his physical limitations gave him time to think. One could not have been more positive. A great inspiration. Zita, thank you for writing about Stephen Hawking, a truly inspirational human being, who defied all odds. (Yes, it is good to be back on the Blog after all the distractions and fun of being in Sri Lanka.) I read in a NYT article that he had traveled to every continent in spite of his physical disabilities. He was also looking forward to traveling to space. Had he lived longer, he may have done it. Mahen, thank you for posting the link to that YouTube video of the very fascinating discussion between Carl Sagan, Arthur C. Clarke and Stephen Hawking moderated by Magnus Magnusson. (I had seen it earlier.) Stephen Hawking outlived the other three, even though he was the one with the life-threatening illness. Stephen Hawking was not above appearing in a car commercial, which was quite amusing, but I don't remember the brand he was advertising! Thanks, Srianee! This is Zita again and I have been away, for a few days, from the Blog. Hence the late acknowledgement. You are right about Stephen Hawking's intention to go to outer space in person, and it is sad that was n't realised. But he had a go at experiencing weightlessness. What we have to make out of his life story is the fact that disadvantages need not deter us from out passions and goals.